Col. Frank Milstead introduced 43-year-old Thomas Yoxall to the media and public today, during a press conference at 1:00 p.m.
Thomas Yoxall is the citizen that saved the life of Trooper Ed Andersson on January 12. Video and photographs of today's conference have been added to the "Photos" link below. Click here to watch an interview with Trooper Andersson. Update for Wednesday, January 18, 2017, at 4:40 p.m.
No video was taken during this incident and it is therefore not available. 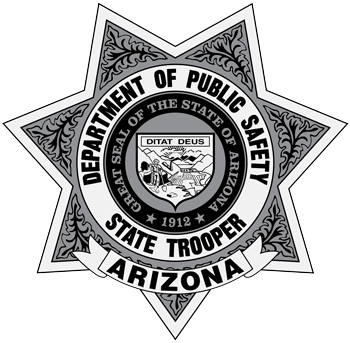 Update for Monday, January 16, 2017, at 2:00 p.m.
Col. Frank Milstead gave an update during a press conference today at 1:00 p.m., outside of the AZDPS headquarters building. Photos and names of the deceased male and female were released. The photos are linked below. Deceased male is Leonard Penuelas-Escobar, age 37. Deceased female is Vanessa Monique Lopez-Ruiz, age 23. Update for Friday January 13, 2017, at 3:40 p.m. When the bystander arrived at the scene, the bystander’s fiancé placed the call to 9-1-1. After the suspect was shot, a third passerby utilized our trooper’s radio and spoke with our dispatch center and asked for help. The bystander who shot the suspect does not want to be interviewed by the media. Our trooper, identified as 27-year State Trooper Ed Andersson, underwent surgery on Thursday, January 12, and he is doing well. He and his family have asked for privacy during his recovery. We continue to investigate and as more information becomes available, we will update this news release. We will provide an update on the identities of the involved parties once the next of kin notification process has been completed. These are the basic points from the Director’s news briefing at the Abrazo West Campus Hospital on Thursday, January 12th, at approximately 9:30 a.m.
4:20am – A citizen called in from Interstate 10 at milepost 81 advising our dispatch that his vehicle had been shot at while he drove. Our responding trooper came across a one vehicle roll-over. The trooper saw an injured female who was later determined to be a passenger from the vehicle. At that moment, a suspect appeared out of the dark and shot the trooper in the shoulder disabling the use of his right hand. A physical fight ensued between the suspect and the trooper with the suspect striking the trooper’s head on the pavement. At that point, an uninvolved third party traveling to California with his wife stopped at the scene, got out of his vehicle and asked the trooper if he needed help. The trooper requested his assistance. That person went back to his vehicle, retrieved his weapon and told the suspect to stop. The suspect refused. The bystander shot and killed the suspect. The citizen then picks up the DPS radio and calls dispatch for help. At the hospital is a deceased female from the roll-over, the dead suspect and the trooper who is an incredibly tough individual in stable condition who underwent surgery. The news release below was posted on Thursday, January 12th, at 7:40 a.m.
At around 4:00 a.m., State Troopers responded to milepost 89 westbound along I10 for reports of shots fired. Upon arrival, one of our Troopers, a 27-year veteran, located a roll-over collision in the area. Our trooper was ambushed and shot by a suspect in the immediate area. A physical fight ensued and as a result the suspect was shot and killed. An occupant of a vehicle that rolled-over in the same area was ejected and pronounced deceased at the hospital. We have not confirmed the identification of the suspect or the occupant of the vehicle that was ejected. State detectives are conducting the investigation. We do not have an estimated time for reopening the highway. Video of Director Frank Milstead's press briefing is linked below.